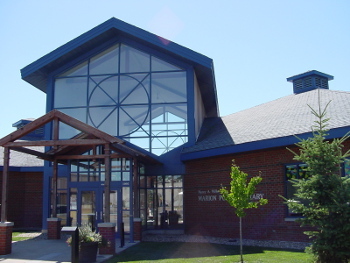 The Friends of the Marion Public Library is a citizen volunteer organization that promotes the use of the library and provides financial assistance for various purchases and programs. The Friends operate a used bookstore, sponsor semi-annual book sales, and provide the Friends Home Books Program for homebound patrons. Funds from the bookstore and sale are used to support reading and speaker programs, purchase special equipment and information resources, sponsor author visits, and help with other special projects. Do your Amazon shopping through the Friends of the Marion Library Smile link, and Amazon will donate a percentage of your sale to our Friends group! It costs you nothing. Select Friends of the Marion Carnegie Library as your charity, or click on the link provided here. Donate books, movies, magazines, and music CDs to our Friends group for sale in the bookstore or at their semi-annual book sale! Just when the first attempt to get library service for Marion was initiated is not known. As Marvin Oxley, Marion Historian and library trustee, wrote in his History of Marion: "Early settlers left (us) little in the way of printed records." None has turned up on the precise date of the pro-library movement. "We must and will have a public library in Marion," reiterated Adeliza Daniels, a leader in endeavors for improvements in the city in which she was born and lived a full life of 93 years. Through her efforts, the Marion Federation of Women's Clubs was organized in November, 1901, by the women of the city for the express purpose of getting a public library for Marion. She wrote to Andrew Carnegie for funds. 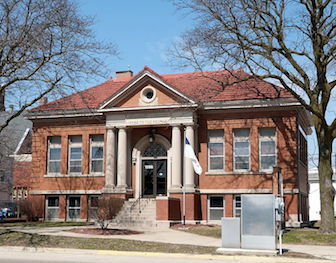 When he donated $11,500, the Marion Carnegie Public Library was on its way. On March 16, 1905, in a civic program, at the Methodist Church, the new library building and its contents were formally presented to the city of Marion. The cornerstone of the building had been laid September 9, 1904. Work started at once. A.H. Connor of Cedar Rapids had won the construction contract with his bid of $9,898. The architects were a Cedar Rapids firm, Dieman and Fiske, with Dieman more frequently mentioned in the contractor's reports. The people of Marion, from the beginning, took much pride in their fine, new library facility. The library corner has consistently been rated and maintained as one of the city's most attractive spots. The Federation, as always deeply concerned, raised funds and bought for the library the lot to the west of the building in 1917. The Marion Carnegie Library was planned primarily for an early 20th Century community of about 4,000 population ... The original facilities proved generally adequate through the first 30-35 years though an occasional voice for enlargements was raised. The trustees and staff were, of course, open to new ideas. The key factor was the city's population. That held virtually unchanged from 1905 through 1940. The 1940 census counted 4,721 residents, about 300 more than for 1910. After World War II, Marion began to grow steadily in both population and area. The 1950 census tallied 5,915 within the city's 2.7 square miles. By 1960, the population had almost doubled at 10,882 and the area almost tripled at 6.7 square miles. The 1965 figures were: population, 15,257; area 89.2 square miles. A special 1974 census gave the population as 18,190 and the area 9.46 square miles. In 1957, Marion Carnegie Library took a big step toward modernization. It established a Children's Department. The auditorium on the first floor, or basement, scene of meetings of the Federation of Women's Clubs, the city council, and many other civic and public groups from 1905 on, was remodeled and refurnished into, as a newspaper account related "a fairyland for youngsters." New and special equipment was installed, again by a gift from the Federation of Women's Clubs. They gave $2,590 and their generosity was specified as a memorial to Marion's World War II veterans. The city met the bill for the remodeling and redecorating. Dedicated September 5, 1957, the children's reading room was an instant success. The trustees, overjoyed, stated "children are our best customers." The new department soon had its own librarian and two staff members, one part-time. But pressure for further expansion kept coming up. Marvin Oxley, Marion historian and library trustee, in a 1959 statement urging civic action, said: "The board has long felt the urgency of obtaining more room so service could be expanded in step with our rapidly growing population," and to accomodate [sic] the growing number of retired citizens. Finally, after some public debate, the voters in November, 1959, approved an $80,000 city bond issue for an addition and other improvements. The two-story addition, which nearly doubled the size of the library, was opened to the public in April, 1961. Less than a year later, the librarian (Mrs. Ruth Mills) was able to report that (as a Sentinel headline said): "People Are Reading More Books Than Ever." In 1931, circulation of books and printed material topped 80,000. In 1961, it was 105,052; in 1978, 149,000. In 1974, a major renovation of the library building and its facilities were completed. Benefiting from a detailed study by the experts they employed, the library board, with Russell Hansen its president, took a long, hard look into the future and decided that the classic design and other values of the 1905 building and its 1960 addition could be preserved and its public appeal and usefulness greatly enhanced by a three-phase remodeling program. This renovation gave the library new entrances, new steps, some windows and storm windows, new restrooms, extensive interior rearrangement, and up-to-ate electrical system and illumination, some new furnishings, and an elevator. This elevator was a first for the city of Marion and a substantial factor in improved access for the handicapped. The library patrons were well pleased.